Snowmobiling is a great activity for winter vacations in Minnesota. This winter vacation package is a a sledder’s paradise at down-to-earth value prices. Lodging in any Fireplace Room for up to 4 people. Cabins upgrades also available. Enjoy Minnesota’s finest sledding with 1,200 miles of groomed trails starting at our Front door. We’re located at the beginning of the Gull Lake Lighted Trail, which connects to the Paul Bunyan Trail, SnowWay 1, and into the deep snowy woods of the Pillsbury Forest. 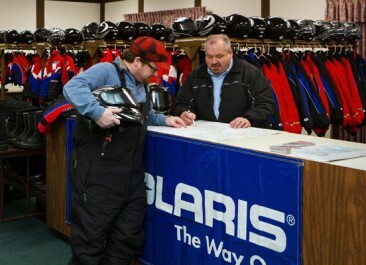 Our Snowmo Center is the largest Resort rental facility in Minnesota, offering a large selection of Polaris sleds, clothing & gear. Full & Half Day rentals. 40% discount on sled & clothing rentals – Monday thru Thursday. Never sledded? 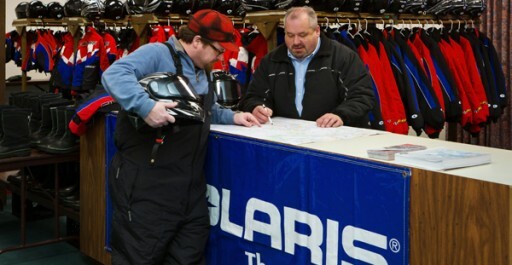 Our expert staff can have you fully dressed and on sleds ready for the time of your life! Great family outings! After hours indoor relaxation includes whirlpools, saunas, huge indoor pool, and indoor Sports Centre.